Rigging, Skinning & Pipeline ..
asNode : Workflow For asNode In Auto Rigging (Part 01) from Subbu Addanki on Vimeo. asNode : Workflow For asNode In Auto Rigging (Part 02) from Subbu Addanki on Vimeo. asNode : Workflow For asNode In Auto Rigging (Part 03) from Subbu Addanki on Vimeo. With Advance Hyper Skinning System (AHSS), you can skin your character at faster speeds at various areas of character. 1. Minor changes might be needed in rig setup and model for better utilization of the tool. 1. Most of the documentation is already provided in above videos. 2. 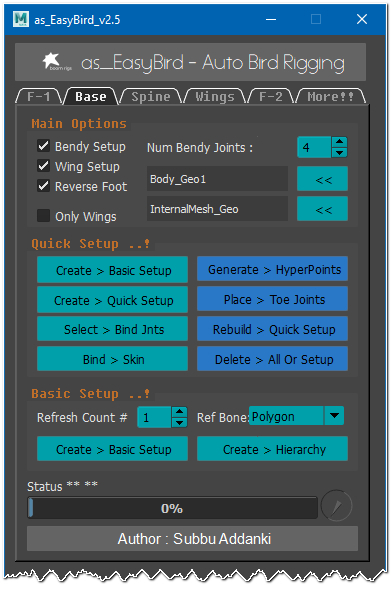 Tool needs basic rigging knowledge. Assuming that, questions will be answered. 3. Additional PDF documentation will be provided for updates & interface help. 4. eMail service will be provided when ever it is needed, during usage of script. 5. No refund will be given.